The Aero Simulation Team’s commitment to Education, Innovation, and Community does not stop at the Florida State line. One of ASI’s T-38 Simulator Professionals, working fulltime at Laughlin AFB (one of our seven national locations) was recently a finalist in the prestigious 2018 Woodie Flowers Award with FIRST. FIRST is an acronym for: For Inspiration and Recognition of Science and Technology. This organization was founded 1989 to promote students’ interest in science, technology, and engineering. FIRST is comprised of four age groups: FIRST LEGO League Jr, K-4th grades; FIRST LEGO League, 4th-8th; FIRST Tech Challenge, 7th-12th; and FIRST Robotics Competition for 9th-12th. Dr. Woodie Flowers, a Professor of Mechanical Engineering at MIT and member of FIRST began his campaign for “Gracious Professionalism” among educators and engineering students in 1990. It quickly became a staple concept for the culture at FIRST. Gracious Professionalism encourages high quality work, emphasizes value of the team and individual, and promotes respect for self and community. For ASI’s Jessie Hernandez, Gracious Professionalism is a way of life. While helping FIRST on multiple levels for countless hours, Jessie says it is worth every moment. He leads his students in the FIRST Robotics Competition which combines sports excitement with the rigors of science and technology. Under strict rules, limited resources, and time limits, teams are challenged to fundraise, design a brand, exercise teamwork, and build and program robots to perform tasks against competitors. The 2018 challenge, FIRST POWER UP, finds teams and their robots trapped in an 8-bit video game. The alliance with the highest score at the end of the match, which includes autonomous and tele-operated periods, defeats the boss and wins the game. All regional teams submitted their nominations for the Woodie Flowers Finalist Award and then judges from FIRST selected the winner. As a finalist, Jessie Herna ndez attended the FIRST World Championships in Houston, Texas on April 18-21, 2018. More than 91,000 students on 3,660 teams from 27 countries competed during the 2018 season; ASI is extremely proud of Jessie being chosen by this group as a leader among men. 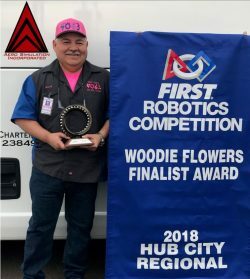 He is no stranger to the accolades of commitment; however, before the Woodie Flowers’ nomination, Jessie was awarded the E-CADET (Every Child Aspires a Desire for Engineering and Technology) Gracious Professionalism Award for outstanding education leadership and support of our next generation of engineers. Jessie also volunteers in his school district at the elementary level with a competitively selected group of 20 local students who build robots under his guidance and then compete to accomplish various programing and real-world challenges. Truly dedicated to his field, this year Jesse’s teams at North Heights Elementary won 1st, 2nd, 3rd, and 4th places in their E-CADET final; his school also won the Pit Award for having the best Mars theme. ASI is extremely proud to have family members like Jesse Hernandez on our team; we are grateful for the success he brings us, and very proud of the success he brings countless students on a consistent basis.